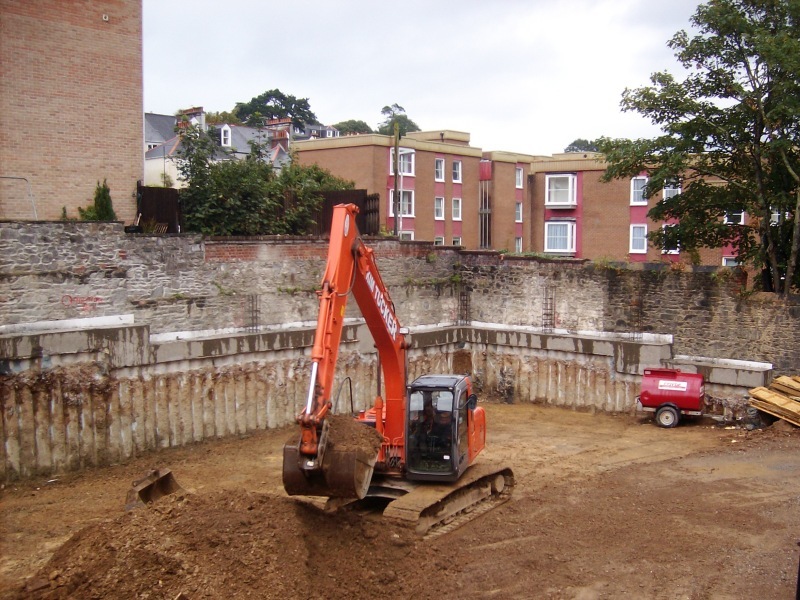 DAWSON-WAM ltd was appointed by Coyde Construction Ltd to carry out the installation of a secant piled retaining wall to enable the construction of a basement under a Priority Housing Project for the Spectrum Housing Group in Plymouth. The works involved the design and installation of 104nr hard/hard secant piles – 450mm diameter at 375mm centres and 8m long – cored into relatively strong mudstone. DAWSON-WAM was awarded the contract on the basis of an alternative tender submission namely that of a hard/hard secant piled wall in lieu of a temporary propped contiguous piled wall. 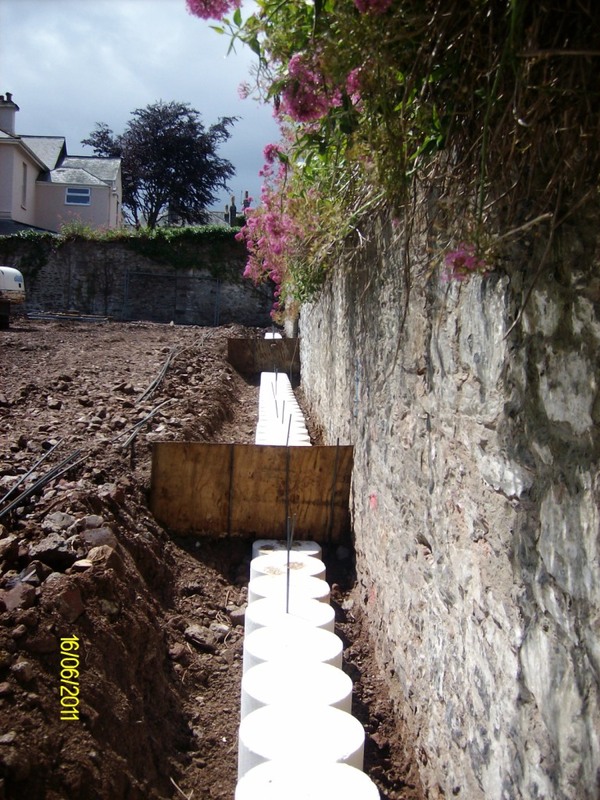 The key element of the project was the secant piles had to be installed as close as possible to an existing 3m high dilapidated stone wall in order to maximise the footprint of the building. The wall was owned by the neighbouring landowner and therefore it was critical that no damage was caused. 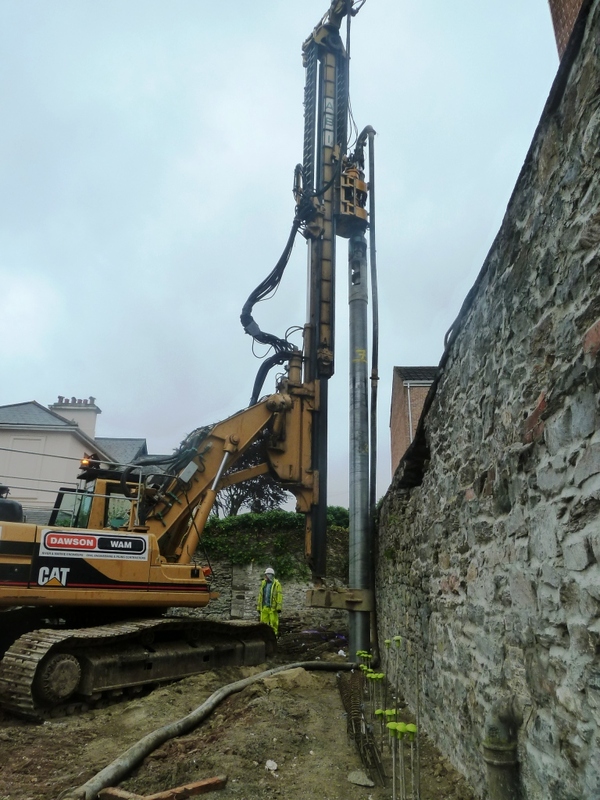 DAWSON-WAM utilised its virtually silent and vibration free cased augered pile system (double auger drive) which enabled the piles to be installed as close as 50mm from the party wall without causing any further damage to what was a very fragile structure. The piles were augered through relatively strong to strong mudstone providing an approximate 4m socket into the competent material. Due to the hard/hard nature of the wall (every pile reinforced) it was designed to deflect no more than 15mm at the head of the piles to ensure the structural integrity of the existing boundary wall remained intact. The piles doubled up as a load bearing wall to enable the structure of the new building to be constructed off the top of the reinforced concrete capping beam providing a cost saving on the original foundation design. The project was completed within 1.5 weeks ahead of the anticipated programme enabling the construction of the reinforced capping beam and bulk excavation to commence earlier than expected. No complaints were received throughout the course of the project in what was deemed to be an extremely sensitive environmental and residential area.